Furnace or a Boiler? What’s Right for You? When was the last time you had your air ducts cleaned? It’s likely that you can’t remember. So many homeowners here and across the country neglect to have their air ducts cleaned on a routine basis and we understand why. You air ducts aren’t a system in your home that you wake up thinking about every day so it can often get pushed the wayside. Other homeowners don’t see the benefit of getting their air ducts cleaned. After all, if your home’s HVAC system seems to work just fine then why schedule a cleaning? This is an erroneous way of thinking that leads you into a false sense of comfort. Indoor air quality problems often seem like other common household issues, but a simple service like this will greatly boost your comfort. If you want to have your air ducts cleaned in St. Paul, MN then contact our team today. There are many airborne contaminants circling through your home daily. Things in your home like dirt, dust mites, pollen, pet dander, mold, and grime all negatively impact your home’s air duct system. If you live in a newer home, then it’s likely that this space was built to be as energy-efficient as possible. This is great for your energy consumption but bad for the circulation of your home. Tightly sealed spaces don’t allow your home an opportunity to expel contaminants. Instead they just circle throughout your home indefinitely. An air duct cleaning can change this. Worsened Cold and Flu Symptoms: Letting contaminants circulate through your system or having unhealthy levels of humidity in your home can make it harder for you to get over colds or even worsen the conditions that you already have. Bad Allergies: If you have poor indoor air quality, it might exacerbate other allergy symptoms you already have. Poor air quality due to airborne contaminants like viruses, mold, and dust mites worsens respiratory problems. 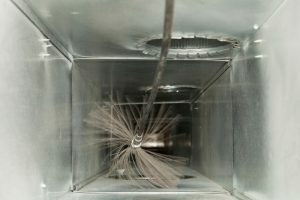 The way we clean ducts here at Residential Heating and Air Conditioning is unique. We offer three levels of duct cleaning, so you can choose the method that’s right for you. The Air Sweep: This is the first level of our cleaning services. If you have your ducts cleaned regularly then this level of service is a good for your home. We connect a truck-mounted vacuum to your HVAC system and then move down each branch of the ducts with compressed air. The Roto Brush: The second level of cleaning we offer is the roto brush. It works similarly to air sweeping. We connect a truck-mounted vacuum to clean out the branch ducts and clean the main trunk of your system with a rotating brush. The Extreme Clean: If you haven’t had your ducts cleaned in a while, the extreme clean is the service you need. It’s our third tier of service and our most thorough job. In this cleaning, we clean the main trunk and clean each branch with an octopus predator whip. Our air duct cleaning services will help you boost your system efficiency and heighten your indoor air quality so that your comfortable all winter long. If you need your air ducts cleaned, contact our team here at Residential Heating and Cooling for thorough cleaning services.